In 2009 I was the Laundry super and had to deal with many temperamental washing machines, in particular the machine named Sir Tinkles (don’t know who named him, but he was never quite right). I spent lots of time learning how to fix those washers and ended up on Maintenance the following season because of it. One of my projects (besides getting the new industrial-size washing machines installed) was to get rid of the machines that didn’t quite cut the mustard. Sir Tinkles was on top of my make-or-break list and I ended up dragging it over to the power house and gutting it for parts. This past summer a woman in a photograph was identified by her lovely granddaughter, Sandra Smith. 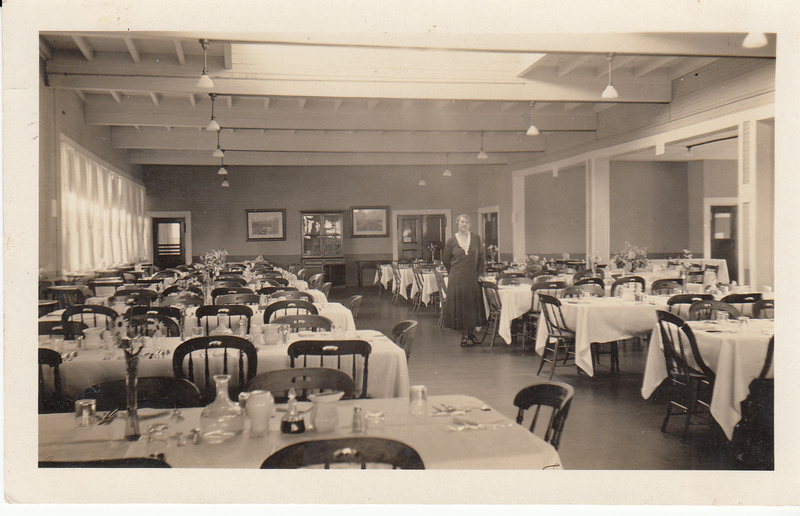 Hulda Marie Hanlon is the woman standing in Star Island’s dining hall in the photograph below. Hulda was in charge of the waitresses at the time of the picture. She was also the head of housekeepers after WWII. Her daughter Elsie Hanlon was also a pel, and Sandra Smith’s mom. I can’t be sure how much of this is accurate, but some of it is corroborated by other historical accounts. I know Pelicans of our day have it easy, and I have heard many former Pelicans talk of the hardships they endured and the badges of honor they won for their dedication and service on Star. But some of this sounds just plain ridiculous. Please let me know if you have more solid evidence of the truth in these pages.